In this hectic modern world of 4G mobile connectivity and 2 hour next day delivery slots, where finding time to ‘just be’ is a skill in itself and having a special place to rest, revitalise, recover and replenish yourself from the stresses of a busy life is so important. Is it still possible to find time to fall completely in love with a place, its people and its attractions? I hope so, otherwise the mountains of Snowdonia with their magical romance and timeless beautiful are not worth writing about and the classic heritage railway that run through those mountains is not worth mentioning either. Thankfully I believe, as do many people, these things are worth mentioning, experiencing and enjoying for yourself. So when I was lucky enough to be offered the opportunity to have a full weekend on the Ffestiniog and Welsh Highland Railways I jumped at the chance. With its patchy mobile reception and old world charm it’s the perfect place to relax and unwind on a Saturday and then learn about volunteering and helping out on a Sunday. 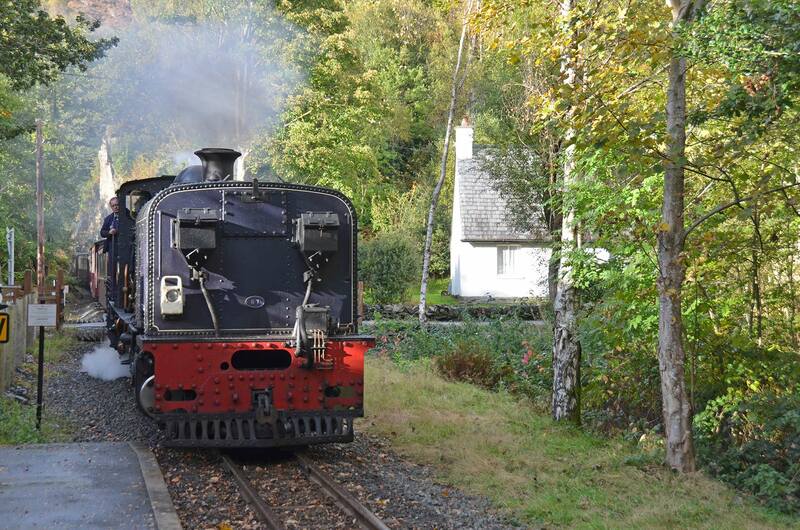 A beautifully sunny, October Saturday, the first return trip from Porthmadog to Blaenau Ffestiniog, behind the magnificent two engine combination of Merddin Emrys and Taliesin. Though I’m told this was not actually for my benefit, but dictated by the rail conditions, I’ll happily over look that fact, for the dreamer, more romantic idea that it was solely to show off these locomotives doing what they do best, pulling a full train of expectant passengers. Now the secret to really enjoying this stunning 13½-mile journey from the harbour to the slate-quarrying town is to turn off your mobile phone. Find a quiet carriage and sit back to enjoy the sounds, sights and smell of a railway that has nearly 200 years of history to offer you. 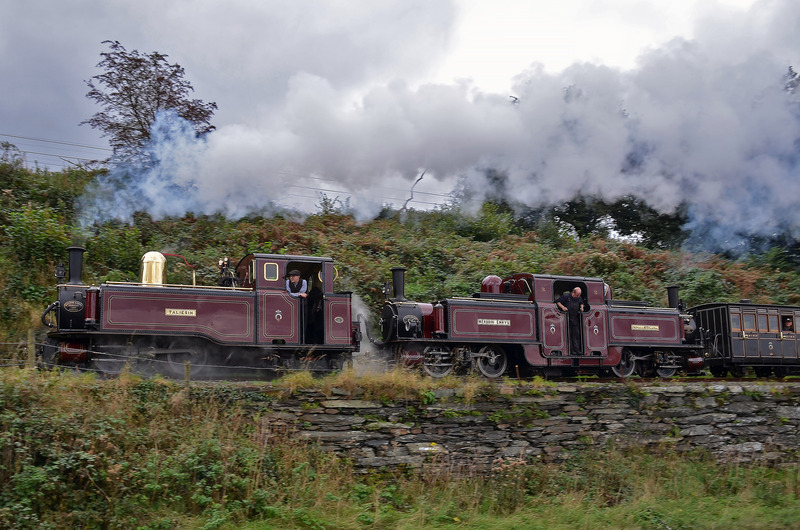 When you get out at Blaenau Ffestiniog, pause and watch while the skilled locomotive crew care for the engines, before enjoying your waiting time – on this run only 20 minutes – before returning to the train and its run back to Porthmadog. A colder, crisper, clearer Sunday and the opportunity to shadow one of the talented fireman, who generously volunteers his time, firing one of the gorgeous Garratt type locomotives (No.87) that run on the Welsh Highland Railway. My turn, the first return trip from Porthmadog to Caernarfon, 50 miles in total. From the moment I got on to that footplate until the moment I got off, I found it hard not to smile the whole time, it was a complete privilege to be able to join the driver and fireman on that turn. An amazing feeling to be standing in such a small size with two such talented and skilled individuals. To be encouraged to help shovel coal into the firebox, remove the resultant ash at Caernarfon, monitor the boiler pressure and water level between Rhyd Ddu and Waunfawr, exchange the token at Dinas, call out the yellow and white lights along the whole run and simply experience the dirt, heat and infectious passion of that space. If it is possible to fall in love with a locomotive (and I know they are many people out there, who would say it is more than possible and easily done) then I totally fell in love with that locomotive, but more than that I fell in love with that day. A day I didn’t want to end and will remember in detail for many years to come, because whether or not I fulfil my dream this year of joining one of the volunteer teams on the Ffestiniog and Welsh Highland Railways, I’ll know that footplate experience will always be the best experience of a heritage railway I will ever get. It’s great to experience steam railways through all the senses – the wonderful sights, the sound of the whistle, the smell of the smoke and steam and the feel of the patina of wood and metal. Maybe taste is the cuppa at the end! t’s great to see that volunteers get great pleasure out of working on the railway as well as doing a fantastic job of preserving our heritage for future generations to enjoy.